July 10, 2012, Woodstock, IL - Newer Technology, Inc. (NewerTech®) http://www.newertech.com, a leading developer of Macintosh®, PC, iPod®, iPhone®, and iPad® performance upgrades and accessories, announced today its new miniStack® external storage solution specifically designed to match the appearance and size of 2010 and later Mac mini computers. With the same 1.4" H x 7.7" W x 7.7" D dimensions and aluminum finish, the two devices can be stacked together to conserve precious desktop workspace while the miniStack is used for storing or backing up large music, photo, and video libraries. While designed to complement the Mac mini, the miniStack is also an ideal space-saving, high-performance external drive that can be used with any Mac or PC. Users have found they can create a 'power tower' of storage capacity by stacking two or more miniStacks while still preserving desktop workspace. miniStack offers up to 4.0TB of storage with data rates up to 500MB/s thanks to a 'Quad Interface' of FireWire 800/400, USB 3.0, and eSATA ports. With its multi-interface flexibility and stackable design, miniStack is the ideal portable external hard drive storage solution to move among multiple Macintosh computers and laptops and virtually any Windows® or Linux®-based computer with a USB or FireWire port. miniStack can also be added to an Airport Extreme® wireless network via USB to wirelessly share files, perform Time Machine backups, and share other devices like printers. Plus, miniStack is A/V rated for high-performance home entertainment systems and sharing content with Apple TV®. 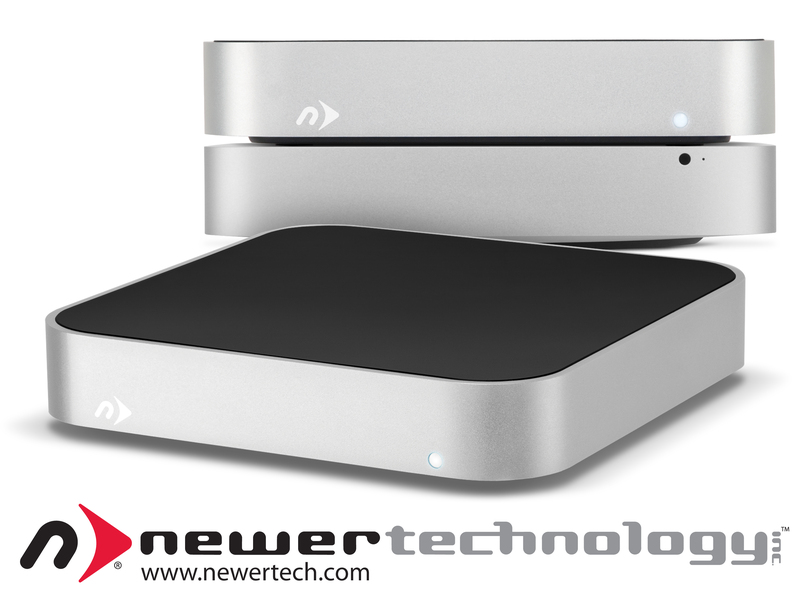 "Since its introduction seven years ago, the miniStack became one of the best selling external drives among Mac mini users," said Grant Dahlke, Brand Manager, Newer Technology, Inc. "Now, with a USB 3.0 interface, matching footprint, and adding over 5x additional storage capacity to the mini's largest factory internal drive option, the newly redesigned miniStack is destined to again become the drive of choice for Mac mini users." Available in five pre-configured solutions up to 4TB, as well as two 'add your own drive' enclosure only kits, the Newer Technology miniStack is available from retailers and Newer Technology's exclusive distributor, Other World Computing (OWC®) starting from as low as $89.99. For more information on the miniStack and reseller inquiries, visit: http://www.newertech.com/products/ministack.php. For more information on Newer Technology's complete line of accessories and upgrades for Macs, PCs, and iOS devices, visit: http://www.newertech.com. OWC is a trademark of New Concepts Development Corporation, registered in U.S. Patent and Trademark Office and in Canada. miniStack is a trademark of Newer Technology, Inc., registered in U.S. Patent and Trademark Office and in Canada. Apple, Macintosh, Airport Extreme, Apple TV, iPod, iPhone, and iPad are trademarks of Apple, Inc., registered in the U.S. and other countries.